A powerful competitive firm, Indian Roller Industries Pvt. 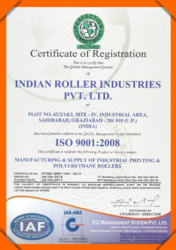 Ltd. was incorporated in the year 1990, with an aim to become a trusted name in the field of Manufacturer, Exporter and Importer an elaborate range of Printing and Polyurethane Rollers. Our catered range of products that maximizes our benefit includes new generation equipments such as, Textile Industries Roller, Biscuits Industries Roller, and Paper Industries Roller. Being the industry leader, we bring forth a productive range of rollers that outputs precision, while serving the promise of reliable performance, innovative printing mechanism and cost effectiveness. With an intense focus on quality, we are capable to hold the legacy of manufacturing expertise. Due to our modernized manufacturing based, we are equipped with an increased demand to produce a large quantity of high performing rollers. A lot of technical experts work for improving the product features, where as a team of dedicated price analysts make possible efforts to cater the most competitive range of rollers. With over two and a half of operational excellence, we have aligned our footprint to success, and have established a global reach by exporting our innovative products to various developed countries. We export and import our products in various countries like South Africa, Nepal, Mauritius, Bangladesh, Malaysia. Our mentor Mr. S. P. Sharma has progressed through a series of manufacturing responsibilities and knows the direction where he is heading us. He is backed with the industrial experience and always inspires and motivates us to nurture the goals we have achieved so far. His vision to encourage every team members helps us to make endeavors to foster the growth and identify our potentials. The roots of our global approach lie in our legacy and due to the extensive industry leading expertise we have achieved a culture of continuous improvement. Our customer centric approach has made us the pioneers in the industry. With adaptation of innovative and digital technological solutions, our offered products have become revolutionary by offering best in class features such are improved ink disbursement and elaborate printing. Our work force is a unique blend to talent and dedication of providing value to every facet of the company. We owe our escalating reputation to the young and dynamic team of highly experienced product engineers, quality officers, sales and marketing professionals. Every member in our team is passionate about their job role and equally accountable to maintain superior level of customer satisfaction. Indian Roller Industries Pvt. Ltd. is an ISO 9001 : 2008 Certified Company.